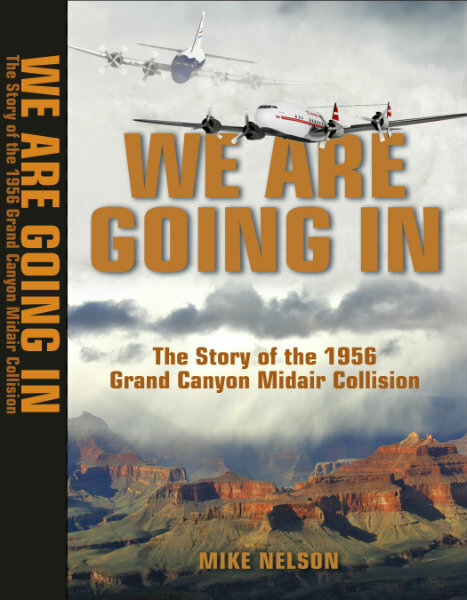 We Are Going In is the only full-length book ever written about the Grand Canyon midair collision of 1956. On Saturday, June 30, 1956, 128 persons lost their lives in a midair collision between two airliners, over the Grand Canyon. Over the decades since it happened, many articles have been written about this tragedy, and many books about airplane accidents in general have described it or at least referred to it. But up until We Are Going In, there has never been an entire book covering just this one accident. My foremost motivation for writing We Are Going In was that I cared. 128 people lost their lives, and I was deeply moved by that. This was the worst airline accident that had ever occurred, anywhere in the world, and the public was shocked, mortified, appalled and deeply saddened. I knew that this was a story that must be told, and I knew intuitively that I needed to try telling it, notwithstanding the obstacles. I had to find a great many persons from the era who were involved with the flights or with the aftermath of the collision, all of whom were complete strangers to me, whose names I did not even know beforehand; I needed to master the principles and customs of aviation as they stood in 1956; I had to locate and obtain many esoteric documents by searching repositories all over the country; I had to contend with and compensate for many crucial documents having been disposed of over the decades; and most difficult of all, I had to approach friends and family members of the victims and ask them to return to their devestation. All of this work I regarded as an honor, not a chore, and I am deeply gratified to have done it, and to have created the present book. Another part of my motivation for writing We Are Going In was to attempt setting the record straight on this infamous disaster. I had never read an account of this accident that didn't contain serious errors. How to explain this sad, incredible fact, I'm not entirely certain, except to say that all of the magazine articles and book chapters that I read about it, seemed clearly based on each other and on newspaper articles written at the time of the accident. In humility and honesty, and also in frustration and indignation, I can say that most of the newspaper stories were very poor, containing grievous or absurd mistakes. In fact, one of the investigators who worked at the TWA crash site told me that the newspaper articles he read at the time were so far removed from what he and his teammates were actually doing, that he honestly, literally believed there must have been a second midair collision in the canyon. We Are Going In is a very detailed history of the Grand Canyon tragedy, citing numerous facts, a number of conclusions in the record that I believe to be correct, and many of my own conclusions. To complete the picture of the truth as I see it, I also contradict dozens of longstanding views that I believe to be incorrect. I spent many years researching all of this, and in many cases, I was able to prove that a longstanding view was impossible, or to demonstrate with lots of evidence, that it made little or no sense. In my book, I offer a number of new interpretations and probabilities that make sense to me, which are consistent with the fullest body of evidence. My attempt has been to present a purely factual account. The actual story is more than dramatic enough and involved enough to be in no need of fictionalizing. As I have rendered it, it begins in its Introduction, not in Chapter 1, starting with my grandfather, who lost his only son, my uncle, in the accident. The succeeding chapters take the reader through the events that caused the tragedy, and through many background topics necessary to a full understanding. I also delve into pertinent intangible subjects like psychology, parapsychology, destiny, and fate. And I have told the story with as much compassion and sincerity as I could muster ~ it is a heartfelt documentary. I wrote We Are Going In as a human drama, and I wrote it because I honestly cared about the victims and their surviving loved ones. I hope that you find it rewarding to read.